Noor with the ACC Trophy. At the tender age of 21, Noor Ali Noori, might not be on the tip of everyone’s tongue when it comes to rhyming off potential heroes set to feature in the dawning T20 World Cup. However as one of the stars of the emerging force that is the Afghanistan national cricket side, Noor will be looking to add to his already impressive list of achievements in world cricket so far. Alongside being part of a team that have achieved a rapid rise through the ICC ratings and being the first ever affiliate team to earn One Day International status, Noor Ali has set some personal milestones along the journey. In his first class debut against a Zimbabwe XI, Ali hit a century in both innings of the game, joining an elite group of three other players who have achieved the same feat on their first class debut. In qualification for the upcoming T20 world cup he was the second top scorer in the competition behind Ireland and Northamptonshire’s Niall O’Brien. He has more recently scored a pair of half centuries against World Cup regulars Ireland, and scored a century in an Asian Cricket Council Elite Trophy game against Bhutan, a tournament Afghanistan went on to win. Fresh from the victory against Nepal in the final, Noor Ali takes five minutes before he jets out to the West Indies to catch up with Cricket Web. Noor, Afghanistan seem to have come from nowhere in recent times, with such a hectic schedule how did it feel to qualify for the T20 World Cup 2010? All our guys are really happy and it was our dream to qualify. We really did work hard for every tournament building up to us qualifying. Before the T20 world cup qualifying round we completed a one month camp in Sri Lanka . When we started the tournament we believed in God and ourselves that we will qualify for the Twenty20 World Cup in the West Indies, and we did! Who are your own cricketing heroes and influences? Ricky Ponting is my hero in cricket. Firstly he is world class batsman and secondly, I believe, the smartest captain in the world. A player like Ricky Ponting will never come around again in cricketing history. If you could choose to play against any team in the world, who would it be? I’d like to play against all the international teams. Especially against Australia and South Africa, because I know I will learn a lot against them. Who do you share a room with when you are on tour? At the moment I share a room with the batsman Kahliqdad Noori, but he is not in this tour, So I am sharing a room with Karim Sadiq now. Which Afghanistan players do you think will be most successful in the world cup T20? God willing, all players will perform in their own job and their own roles. How popular is cricket compared with other sports in your country? As a result of our achievements over the last two years cricket is very popular in Afghanistan. Especially it has become more popular since we qualified for the T20 World Cup in the West Indies. Whether we are playing ICC or ACC (Asian Cricket Council) all our matches are now our now broadcast in Afghanistan on 7 or 8 different radio stations . And ball by ball scorecards are available from all TV channels in Afghanistan. Live matches, from the World Cup, will also broadcast from all channels in Afghanistan. You scored a century in each innings in your debut first class game for Afghanistan, will scoring triple figures at the World Cup emulate that achievement? How will the conditions in the West Indies compare with the conditions that you are used to playing in? The conditions will be a big change and very different from what we are used to, but we are going to the West Indies two weeks before the World Cup, to give us time to prepare. So you’re playing South Africa in your final group game, a win takes you into the Super 8, you need a boundary off the last ball, Dale Steyn is running in, which shot will you rely on to get the ball over the rope? and try to hit in gap or over the rope! Noor will be looking to find the rope and have the Indian bowlers putting out a May day call as Afghanistan take on India in their first game of the group stages at the Beausejour Stadium in St Lucia on the first of May. Interesting read. Glad there’s good coverage over in Afghanistan. Good interview. Will be nice if Afghanistan do well. I think you really want to get used to West Indies tracks if you can. They’re generally very slow and take lots of turn. That lack of pace is something you want to adjust to as much as possible. As I’ve always said with slow pitches they’re horrible for cricket. They ordinary players into heroes and heroes into ordinary players. It all becomes about bowling variations, bowling very straight and fullish, wait for the mistakes and if you’re batting brute force it down the ground. Very nice. Inshallah Afghanistan will beat both India and South Africa! Interesting that the Afghan cricket captain should like a cricketer known for his likeness to Bush – the man who invaded Afghanistan. AMAZING BATSMAN! 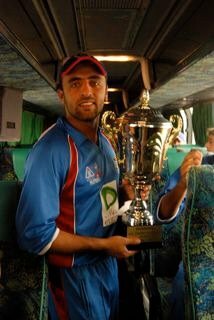 Very proud of him and the Afghan team making it this far. Their fielding is amazing against India.